A CRISPR-mediated Selfish Gene? Grunwald and colleagues design a “CopyCat” element that drives its own inheritance in the female mouse germline. Modelling multigenic human diseases in mice can be very costly and time consuming due to the low frequency of animals that have the correct genotype. For example, if three independent alleles are involved, 146 offspring are required for a 90% chance of producing a single animal with the disease genotype. Recently, CRISPR/Cas9 technology has been employed to drive inheritance of specific alleles in insects. In these studies, a cassette consisting of Cas9 and a gRNA targeting a gene of interest was inserted into the site targeted by the gRNA, disrupting gene function. This cassette led to cleavage of the homologous allele, which when repaired by homology directed repair (HDR), copied the cassette into the second allele – thereby driving its own inheritance. Grunwald and colleagues investigate how this technology can be applied to mice. The authors designed a “CopyCat” element consisting of a gRNA targeting their gene of interest (Tyrosinase) and a fluorescent reporter (CMV-mCherry) – see figure below. This cassette was knocked-into exon 4 of the Tyrosinase gene, disrupting gene function. 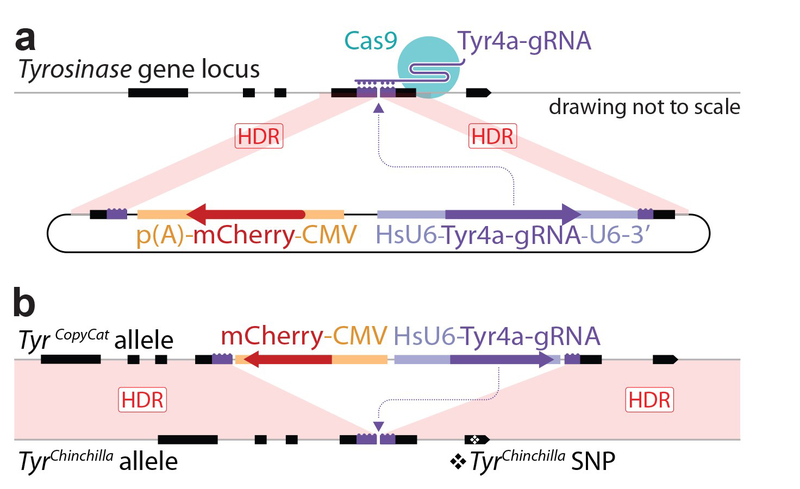 When bred with mice constitutively expressing Cas9, the gRNA and Cas9 protein are united at fertilisation in offspring. This resulted in homozygous loss-of-function, indicated by an albino phenotype. However, further analysis found that gene disruption was due to insertions/deletions (“indels”) resulting from non-homologous end joining (NHEJ), rather than homology directed repair (HDR) conversion using the “CopyCat” allele. They hypothesised that mutagenesis was induced too late – missing the optimum window for HDR in early embryogenesis. They overcame this problem by controlling the activation of Cas9 expression with Cre recombinase. Activation of Cas9 during oogenesis with Vasa-Cre led to 45% of offspring in the next generation carrying the HDR converted allele (17% carrying indels and 38% where the gene was not mutated). While successful in the female germline, HDR was not detected when Cas9 was activated by either Vasa-Cre or Stra8-Cre in the male germline. This system will dramatically improve disease model production in laboratory studies. While the high HDR efficiency achieved in the insect studies led to the proposal that this technology could reduce wild populations of malaria-carrying mosquitos, the authors conclude that this method should be optimised further before it could be considered applicable for the control of invasive rodent populations. Figure 1: Schematic of the “CopyCat” system. (a) The “CopyCat” cassette was knocked into exon 4 of the Tyrosinase gene. (b) Cas9-mediated cleavage of the other allele can be repaired by homology directed repair (HDR), resulting in the copying of the “CopyCat” cassette and disruption of gene function. The authors have developed an elegant CRISPR-based system for driving inheritance of a modified allele. Their findings highlight the importance of tightly controlled Cas9 expression, furthering our understanding about the time windows when HDR is the predominant repair pathway in gametogenesis and early embryonic development. In contrast to the cassette used in insects, this is the first study that combines gRNA and Cas9 genes from different parents-of-origin. Altogether, it is an excellent example of how CRISPR/Cas9 technology can revolutionise in vivo studies. Ideally the method could be adapted to successfully drive inheritance in the male germline. The authors used existing Cas9 transgenic lines, limiting their choice to two constitutively expressed alleles that were activated by the removal of a “STOP” cassette by Cre drivers. The creation of novel transgenic lines where Cas9 is driven by cell-type specific promoters could limit Cas9 expression to the critical time window during spermatogenesis (and would simplify the method by eliminating the need for Cre transgenes). Promoters that transiently express Cas9 may also reduce toxicity – previously reported to occur when both Cas9 and gRNA are continually expressed. Lastly, I wonder whether the HDR rate would increase with a smaller cassette [the “CopyCat” cassette is 2.8 kb]? Thank you for your preLight! I like your questions/future directions. Yes, we do think we can improve efficiency using a different promoter to drive Cas9 (and directly rather than in a conditional system). We have mice to work on that next step now. We are also interested in developing an inducible system once we get the timing right. Last, we aren’t sure if a smaller piece would mobilize more efficiently, but we are interested to see what happens to larger pieces.